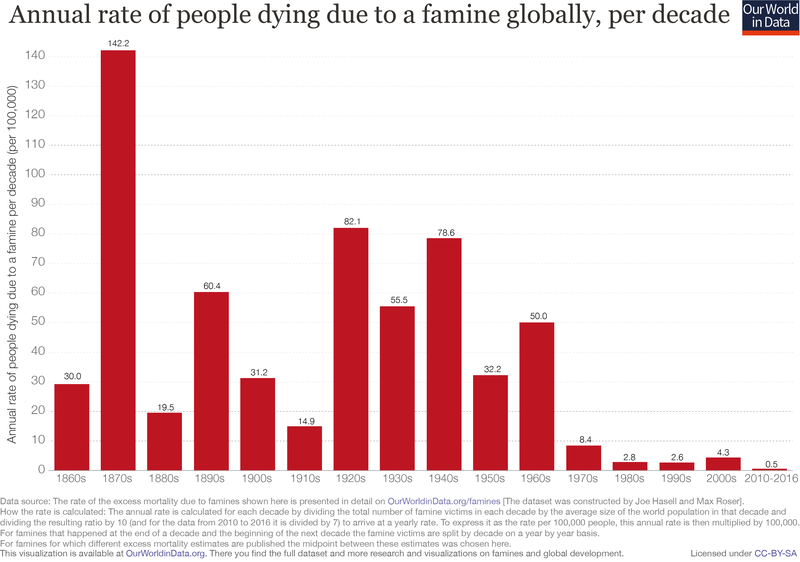 This blog post draws on data and research discussed in our entry on Famines. Recently, we published a comprehensive dataset of famine mortality over the last 150 years – the outcome of several months&apos; work that brings together a range of sources on particular famines into one place. In this post we show that, despite the uncertainty that surrounds mortality estimates for many individual famines, the overall long-run trend is clear: in recent decades famine mortality rates have fallen abruptly to much lower levels compared to earlier periods. In a second blog, we discuss some of the reasons for this decline. The following chart shows the estimated number of people dying in individual famines since the 1860s, based on our dataset which can be found at the bottom of our main entry on Famines. The length of each line shows the duration of the famine and the color shows the continent in which the famine occurred. What this chart doesn&apos;t show however is the significant uncertainty that surrounds many of these estimates. As we discuss in our section on Data Quality, historical famine estimates are frequently based on very scant demographic information, and even where such evidence is available there is still disagreement in its interpretation. As such, many of the famines included in our dataset are associated with a wide range of plausible mortality estimates. In our data, these are represented by upper- and lower-bound estimates, with the mid-point being shown in the visualization above. Two apt examples, discussed in more detail in the notes at the bottom of this post, are the famines in the Democratic Republic of Congo, which took place amidst the Second Congo War beginning in 1998, and that of North Korea from 1995 to 1999. 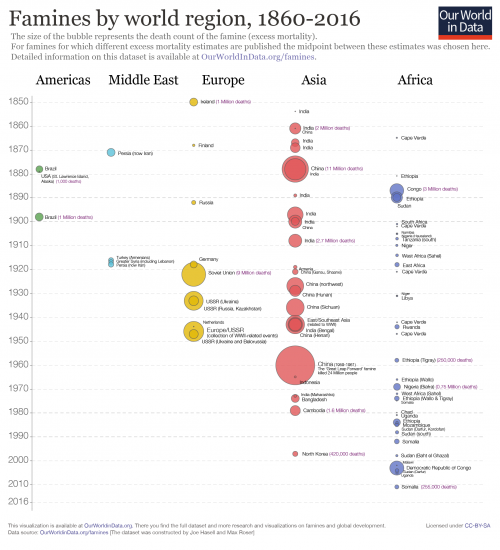 These famines stand out in recent decades for their particularly high mortality. But in both cases, the range of mortality estimates available in the literature is large, with high and low estimates varying by several millions of deaths. Where such differences are present, our midpoint estimates are clearly very sensitive to our choice of upper and lower bounds. We have not simply taken the highest and lowest figures published in the public domain, given that more accurate estimates often emerge with time. As noted by the World Peace Foundation, “generally speaking, better demographic calculations lead to lower estimations of excess deaths than those provided by journalists and other contemporary observers." Rather, we have sought to select upper and lower estimates based on the balance of opinion in commonly-cited sources, all of which are detailed (for each individual event) in our dataset of famines. Inevitably though, this meant us taking a position in some controversial cases, discussed in detail here. Whilst the number of deaths caused by individual famines is often subject to a good deal of uncertainty, the overall trend over time is very clear: compared to earlier historical periods, far fewer people have died in famines in recent decades. Whether we consider high or low estimates, or something in between, does not affect this conclusion. Relative to the growing world population this trend is all the more notable. Below we show the rate of famine deaths globally, expressed as the number of people dying each year per 100,000 people of the world population, again based on our midpoint estimates for each famine. The chart presents this rate averaged across each decade since 1860. You can see that the famine mortality rate fell to very low levels over the second half of the 20th century onwards. The geographic spread of famines has also reduced over this period, as we can see in the chart below. While in earlier periods Asia suffered heavily from major famines, this came to a halt over the mid-20th century. Since then, famines have almost exclusively been restricted to Africa, with the famine in North Korea being a stark exception. The sharp reduction in famine mortality represents "one of the great unacknowledged triumphs of our lifetime", as famine researcher, Alex de Waal describes it.1 A continued decline, however, is far from assured. As we consider in a second blog though, the long-run developments that have contributed to the sharp decline in famine mortality do suggest that the type of catastrophic famine seen in the nineteenth and twentieth centuries is unlikely to return. The great disparity between these two estimates largely lies within the assumptions made about the number of people that would have died anyway in the absence of the Second Congo War, with the Human Security Report arguing that the IRC estimate adopts an overly optimistic counterfactual. So called &apos;excess mortality&apos; estimates are always highly sensitive to the choice of baseline mortality rate, but this is particularly true for crises that extend across several years such that the counterfactual trend in mortality has to be considered also. They also argue that the survey data on which the IRC estimate is based is, for some periods at least, unrepresentative of the country as a whole – a perennial issue in famine demography, given the typically patchy availability of data. The number of people that died in the North Korean famine remains highly uncertain, largely due to the closed nature of the country. This has precluded access to official data and other channels of inquiry, such as surveys. Estimates range from the North Korean Government&apos;s &apos;quasi-official&apos; estimate of 220,000 to the 3.5 million arrived at by South Korean NGO, Good Friends Centre for Peace, Human Rights and Refugees by extrapolating from interviews conducted with refugees fleeing the country. See, for instance Ó Gráda Famine: A Short History (2009), p.94 and Haggard and Noland (2005). Ho Il Moon's estimate of 336,000 published in a recent article for VOX, also falls in this interval. Again it is based on reconstruction of intercensal demography.